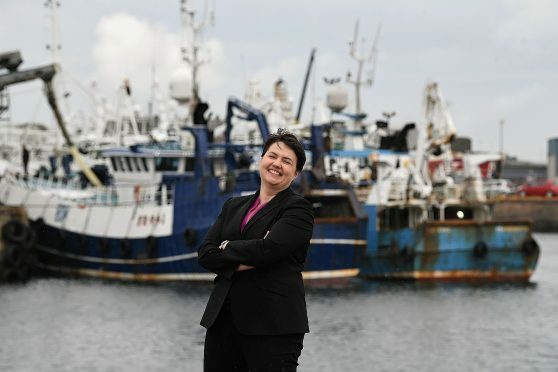 Scottish Conservative leader Ruth Davidson landed in the north-east yesterday as part of her whistle-stop helicopter tour of competitive seats. Ms Davidson joined her party’s Banff and Buchan candidate, David Duguid, on a visit to trailer manufacturing company Gray and Adams in Fraserburgh. She subsequently visited Gordon candidate Colin Clark at Kintore company E-Blast. Just days before the polls open, the Tory leader encouraged voters in Aberdeenshire to send a “clear message” to Nicola Sturgeon they do not want another independence referendum. She said: “Things are changing up here in the north-east. “People increasingly want to see the SNP get on with the job in hand – improving public services like education and health – and not obsessing about independence. Mr Duguid said: “Here in Fraserburgh, our fishermen know the SNP want to drag them back into the EU and the disastrous Common Fisheries Policy. Banff and Buchan is also being contested by SNP candidate Eilidh Whiteford, Liberal Democrat Galen Milne and Labour’s Caitlin Stott. In Gordon the other candidates are former SNP First Minister Alex Salmond, Liberal Democrat David Evans and Labour’s Kirsten Muat.